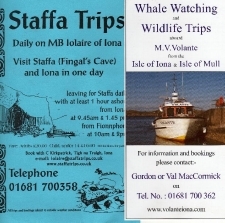 Why not spend half a day on both Iona and Staffa? Boats leave from Fionnphort which is a leisurely 35 minute drive from Pennyghael Hotel. Park up for free at the St Columba's visitor centre and stroll down to the quay where you can take your boat to either island. We recommend you take in Staffa in the morning, then spending the afternoon on Iona. Both companies listed below operate daily though cancellations may occur due to rough weather. We're happy to book either trip for you. If you only want to visit Iona we recommend you go with Caledonian MacBrayne who sail to Iona at regular intervals throughout the day during the summer and up to 4 times per day during the winter. Pennyghael Hotel is an Isle of Mull Hotel offering B&B accommodation, Restaurant and self-catering cottages in a great location for exploring the Isle of Mull, Scotland. The Pennyghael Hotel is situated in an idyllic location, on the shore of Loch Scridain on the stunning Hebridean island of Mull.